Over the past few weeks I've been talking to Neapolitan trouser makers Marco and Massimo Cerrato, and commissioning the pair in cotton drill pictured here. I'm pleased to say that it looks like we have a reliable, good-value maker at a very high quality level who - best of all - effectively has a permanent branch in London. Marco and Massimo come from an old trouser-making family in Naples. There are a lot of these, as you might expect, mostly located around the Spanish quarter. But the Cerrato family are one of the best-known, alongside the likes of Ambrosi and Pasquale Mola. It was founded by Ciro Cerrato, who began work as a presser in the workshop of Antonio Mola at the age of 13. Ciro would eventually marry one of the hand-sewers there, and the two of them left to set up their own workshop when Ciro was 20. That same year (1974), their first son Carmine was born. Three more sons would follow - Marco, Massimo and Antonio - with only Carmine not in some way joining the family firm (he became an engineer). "Back then the workshop was small," Massimo says. "There was just my father cutting, and perhaps five ladies sitting around a table, each doing a different stage of the handwork. They did perhaps 5 or 6 pairs a day." Today, the workshop is larger. Ciro and Marco do the cutting (Marco mostly new customers, especially international ones), there are seven ladies doing the handwork, two on the sewing machines, and one just doing basting. Uncles, cousins, in-laws - largely family. 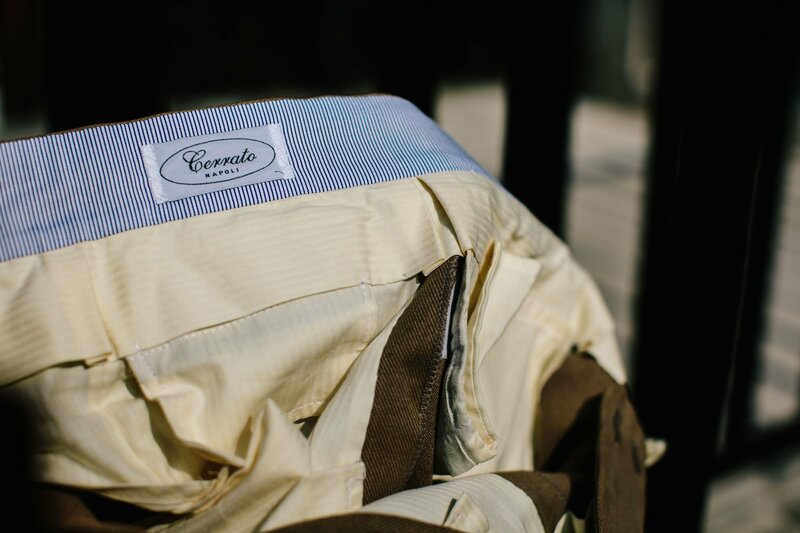 Cerrato produces up to 20 pairs a day, both under its own label and for a handful of tailors in Naples. Interestingly, the amount under its own label has increased steadily. "It used to be that men just wanted trousers with suits and other formal clothing," comments Massimo. "Now more are wearing separate trousers, more casually, so the demand for our work has increased." Massimo trained as a trouser cutter, but now lives in London. He wanted to travel, to be somewhere other than Naples. So he worked as a chef while improving his English and looking to establish a UK branch for the family business. It was Massimo that measured me and fitted me for the trousers you can see here. There is clearly a strong link between brother and brother ("we sound so similar - often people can't tell us apart on the phone," Massimo says) because with a few measurements and a phone call, the order was made and the result as good as meeting the cutter himself. So what of the trousers? They were made in a relatively heavy English cotton drill - 15.5 oz from Drapers' Melrose bunch (6632). It's an olive-coloured cloth that has softened wonderfully in the wearing, and I'd certainly recommend. They were made with a deliberately broad waistband (partly for aesthetic reasons, partly fit) that is fastened with two buttons, with a 5cm turn-up. The larger, antiqued-brass side adjustors were required to fit the thick cloth. The fit was superb. Almost no adjustments were needed at the fitting - and those largely around personal taste, eg a tighter waist and slightly slimmer thigh. As to the make, the obvious comparison is with Ambrosi, whom readers will likely know well and we reviewed earlier in the year. The construction is essentially the same, with just a few more hand details here and there on Ambrosi. So there 18 hand-sewn tacks around the top of the Cerrato pair, for example: reinforcing the top and bottom of the side pockets, of the coin pocket, of the join between fly and waistband; whereas Ambrosi has 20. And those are not necessarily two extra. Rather, they differ in where they put them: Cerrato has one at the top and bottom of the join in the back of the waistband, and Ambrosi only having one. Inside, the hand-work around the curtain on the waistband is equally neat and all hand-sewn. The significant difference is that the bottom edge of the curtain is all hand-sewn on Ambrosi, and merely folded on Cerrato. 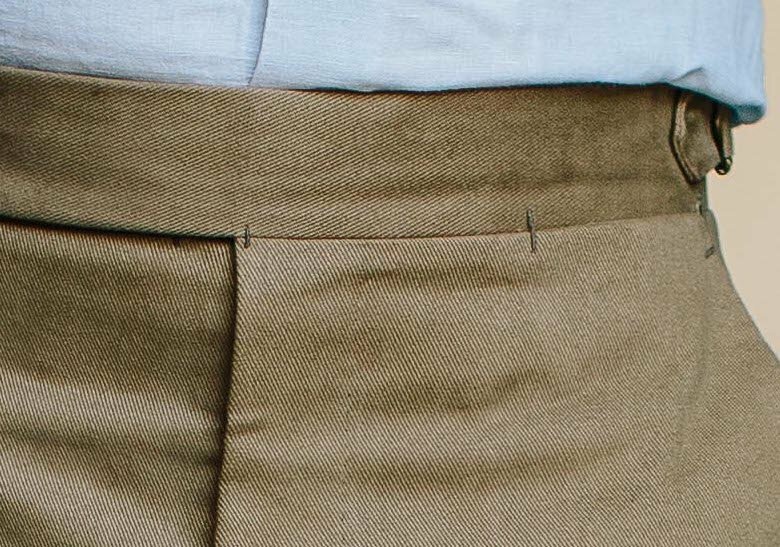 Ambrosi also pick-stitched the external long seam on the trousers, where Cerrato did not, which is a lot of work. It's important to remember that these are all aesthetic, and relatively small, differences. 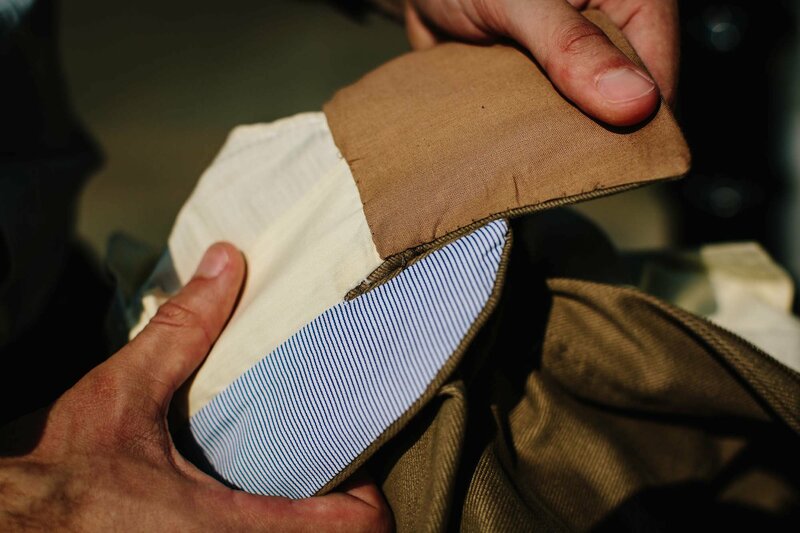 The work is all far more than you would find on English bespoke trousers, and indeed more than Parisian ones - although the work on Cifonelli, for example, is neater and more precise. Cerrato can also do the extra handwork (or any designs) if asked. Most Neapolitan trouser workshops are used to working for different clients and have little house style. For us in London, the most important thing is that Cerrato trousers are relatively cheap (from £550) and with Massimo based here, there is no need to wait for a visit from Italy. Massimo is currently taking appointments around his other work - so after 4pm during the week, and at weekends. He visits clients in their offices and homes, with arrangements made initially through Naples (Marco at marco.cerrato76@gmail.com). There are also tentative plans for Marco to come to London occasionally, but for the moment readers can see him during our trunk show in a few weeks. Note: As with all the photography on this site, the trousers were shot as naturally as possible, after several days wear (sitting down in an office for long periods). I do not believe in shooting freshly pressed clothes, or artificially pulling/tugging/arranging them to make them look perfect. It's not realistic and it's not useful. You can follow the discussion on Cerrato bespoke trousers, Naples by entering your email address in the box below. You will then receive an email every time a new comment is added. These will also contain a link to a page where you can stop the alerts, and remove all of your related data from the site. Great to see, and a very instructive post, thanks. Can you comment on the relative formality of the features that mark tailored cotton trousers out from most common RTW today (extended waistbands, side adjusters, turn-ups, pleats, etc)? In other words, do (some of) these features rule trousers out for casual / weekend usage, do you think? Turn ups might look out of place sitting over common projects. Generally things that interrupt the lines like turn-ups are actually less formal, but it’s really that elements like these seem more showy and therefore less casual. So you’re right, they will make such trousers slightly less suited to trainers. Also, perhaps more importantly, the fact that most casual cotton trousers are garment washed, and therefore look soft and worn in, makes them look far more casual. That makes a bigger difference than any style points, and is why you should never go to a tailor for what you think of as chinos. Thank you for lovely review. Could you comment on pants front vs back raise angle/difference. Some makers seems to have quite substantial drop while other no at all. Is it just stylistic aspect to adapt to body curvature? It is largely to adapt to body proportions, as you say. Aesthetically, it usually looks better if the top is flat, so the back and front are at the same height. Attitude to how much to adjust that for fit varies with tailors. Personally I don’t think it makes much difference and I’d always prefer a superior fit. There was one fitting, right? Also, how would you compare this pair to the one of C&M you have? As far as I understood C&M have been upgrading their trouser making. Great post (that I have been impatiently waiting for)! You mention that the detailed handowork is beyond what you would typically find in bespoke English trousers (usually priced at 1,000 GBP+ on Savile Row). Could you please elaborate a bit more than the above? I am asking because I had a pair made by W&S which I found to be great value (only 480 GBP) and which had a number of the features you are mentioning above (the hand-sewn tacks, top-stitching on the edge of the bands) if not more (e.g. lose side-seam, piping of the flap on the back, etc.). I am just trying to think whether there is a good reason for me to try out a Neapolitan maker like Cerrato for my next pair rather than W&S (I could still use both in the future if I feel there are some differences here and there which would make me more keen on one or the other for each pair). Cool, thanks Simon. I am sold. Will be in touch with the Cerrato brothers and will hopefully also meet Marco during the trunk show day. Regarding trousers generally what do are the rules regarding slim leg, tapered leg, regular leg ? When is each appropriate or does ones own body shape determine that ? Furthermore, what (range of) width of hem is best ? It’s a question of style, and as in most areas of tailoring, moderation is the key. You might favour a slightly narrower or slightly broader lapel, but never go too far. It is also, as you say, a question of balance and proportion. A larger man needs a larger leg necessarily, for comfort, but might also look to have a wider hem at the bottom to balance with a larger shoe. Less moderate proportions are also generally less formal, more casual. So for a formal trouser I tend to have a knee measurement of around 18.5 inches, and bottom hem of 16. A casual trouser like the cotton here is more likely to be around 18 and 15.5. Simon,may I ask what shoe size you normally take?Personally,I find that 17 inch trouser hems balance my 10 1/2 shoes. I’m sorry, but I don’t think the trousers fit you properly based on the pictures. The pockets are open when standing (even with thei slant and slightly curved pockets). It is often because your trousers are too tight around the hips. Horizontal ceases around the zipper (maybe because of your tucked shirt) may suggest that. On slim flat-front trousers, 2 darts near the front pockets often help. Rolls around your crotch (may be due to wearing) are not a good sign of a well made pair of trousers, especially on heavy cloth. Thanks Eric, but they are not too tight on the hips or need darts. A cotton like this has essentially no drape at all, and will sit into almost any shape you put it in. That’s far more important than the weight. No matter what cut, sit in a cotton like this for several hours and use the pockets, and they will look like this. With Eric on this I’m afraid. The pockets are open, the knees in pic 4 are showing a crack and there is too much horizontal stress on the fly. It seems a shame to spend so much for quality work if the end result is a slightly off fit. I agree you cannot conclusively assess fit from a series of photos, but if the photos show plenty of apparent issues, it is likely that they exist; it is then just a question of degree. I’d disagree there are any fit issues, but let’s leave it at that. Come on, guys. These trousers are made of cotton, so they don’t have the type of elasticity that wool has. Cotton can’t be shaped the same way by a tailor, yet it will also bag with use. Simon made it clear that he has worn these trousers. I’m sure he has already reached into the pockets many times, which will cause them to loosen. And because he has worn them, they show basic signs of wear from cotton. Many thanks for this very interesting report! The aesthetic aside, I also love this amount of weight for trousers! Thank you for this post. Do you know if Cerrato do any Trunk Shows in Paris? No, the plan is just to do London for the moment, not even NY or HK, despite some nice offers. How does your Caliendo trousers stack up compared to the Cerrato one? I noticed Elia has made a few for you but yet to see a review. Yes – a review would be most helpful. I was in Naples recently to commission a suit and interestingly found out that most houses don’t actually make the trousers – your article confirms this. A ”specialist” generally does the work. Incidentally that house (currently) uses the same one that I wanted to commission a trousers from and since the first fit of the trousers was good I decided against engaging that ”specialist”. I understand that the specialist would have cut the trousers differently but would the level of finishing be the same? I also understand that Caliendo does everything in-house. How do you take care of the trousers. You will wash them in your machine or just will use brush and steam like with your other bespoke items. How many wears do you normally give tailored trousers before dry cleaning, Simon? Or is it more a matter of if they for some reason get catastrophically dirty? Is there a particular gap that high-end tailored cotton trousers fill in your wardrobe? I can see the need to have casual knocking around chinos like say, Incotex for wearing with knitwear and casual shoes; wool odd-trousers for sports jackets etc, but I fail to see the rational behind a pair of very expensive cotton trousers – unlike wool, all cotton chinos bag at the knees and start to stink after more than a day or two of wear. These issues are easily resolved with a quick wash and blast of the iron – things that you probably can’t do with a pair of £550 Cerratos. Theylook fantastic and obviously are beautifully made but surely they can’t escape the fundamental limitations of the material from which they’re made ? Rather like the cotton suits I’ve referenced in recent months, I find tailored cotton trousers are a nice bridge between the formal and the casual. Smarter that the trousers you might expect at the weekend (rather like my suggestion of wearing tailored linen trousers on holiday) and surprisingly smart for cotton around the office. I also don’t find that my cotton trousers bag at the knees that quickly or stink after a day or two. The first can be mitigated by hanging them consistently (even by the cuffs if you can) and occasional pressing. The latter might be more a personal issue, but as with other tailoring, brushing down, steam though pressing, and the occasional dry clean makes a big difference. Bravo . Do you remember I recommend Pasquale Mola – cerrato is his brother. Yes I do. And brother in law, I think, in that Ciro married a Mola daughter, as mentioned? This is perhaps a silly question but do you have any recommendations for a good steamer? Very funny – but not what I meant obviously. My hope is that Simon may be able to recommend a clothing steamer. Absolutely beautiful trousers. 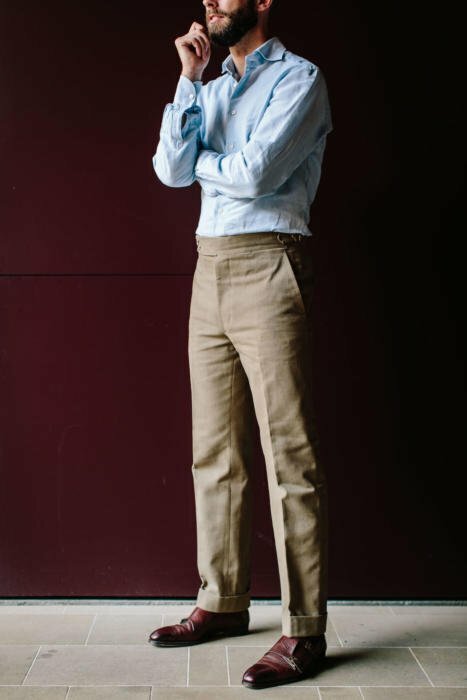 How would you compare them in terms of formality with the Drake´s chinos of last month? Couldn´t you wear both in the same situations and combinations? The cotton makes these less formal. The Drakes cotton is cleaner and harder, with also a bit of stretch. thanks for the post! Have you tried sitting down in those pants? Is it possible? Beautiful trousers Simon. A couple of questions – what do you mean by garment washing? And have you got any tips on getting the trouser length right? Yours look great in the photos. Without shoes, do you aim for a straight line at the back and small break at the front? Or shorter so they sit horizontal when you wear shoes? Simon, I understand that many Italian tailors don’t do side adjusters on trousers. These look very nicely done. 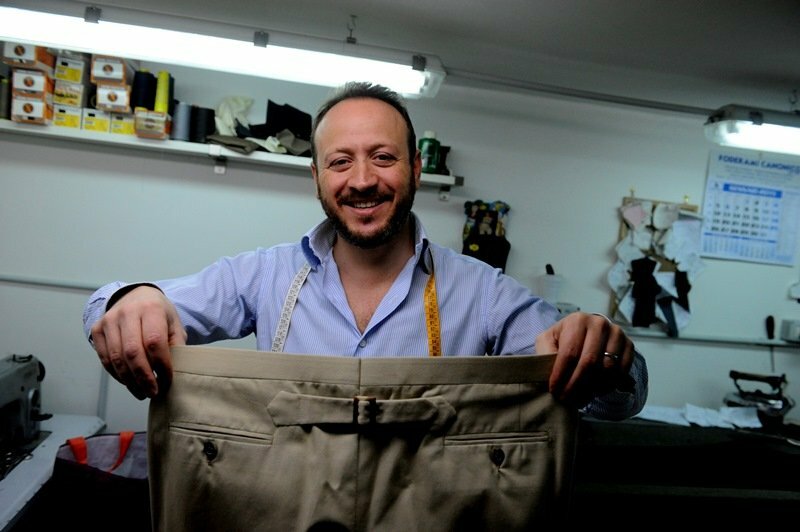 What has been your experience with Italian tailors and self-adjusting trousers? Do you know the average turnaround time Simon? Superb trousers! Fit looks spot on, honestly I don’t see any odd wrinkling around the crotch. Lucky londoners that can have neapolitan items made without taking the plane! I think they are a great pair of trousers. I like the fit despite some comments above. I like the detail of the wide waist band with the double buttons – a bit different without being overly fussy. Personally, I think these look better than the Ambrosi’s you commissioned. The trousers look as if they’ve stood up very well to the wear given the material. Would have been nice to actually have a shot of the back? Id like to have some casual trousers made to wear with sportsjackets but £550 is too much for me I’m afraid. Are there any other options out there Simon more around the £300-350 mark even if its MTM? Simon in other posts you have mentioned that you like belt loops with casual trousers so that the beauty of a leather belt can be shown. 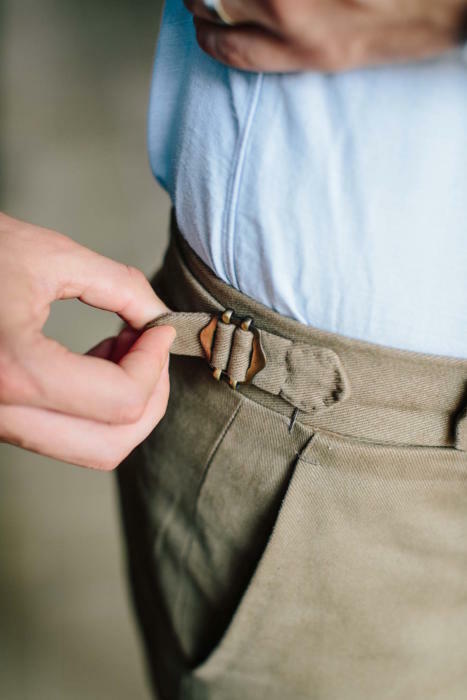 What is your reasoning process for choosing between side adjusters or belt loops on trousers like these? I’m having some trousers made by Elia but from what I can see in the images Cerrato will be my next call, great fit. If you were to wash these in a machine what would that do to the material? I’ve seen Mr Dalcuore wearing a cotton suit which he has machine washed over many years for a really superb aged look. Probably not Colin, no. Linens and cottons may need a little extra length to compensate for when they wrinkle, but I’ve generally found that very hard to estimate – it varies so much with the different linen/cotton. 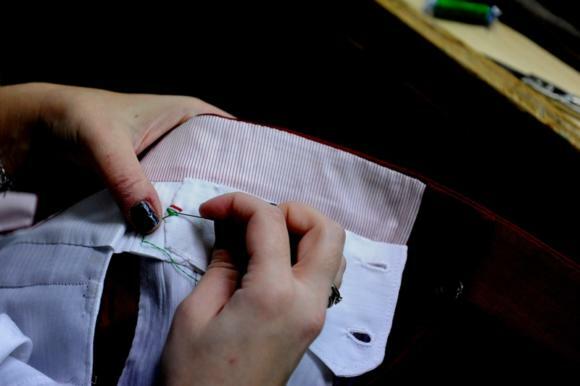 Better to have them made then make any small alterations with a local tailor. I have had several,pairs of trousers made by Luxire over the last couple of years, in cord, flannel and linen, and all from the various Dugdale books they carry. 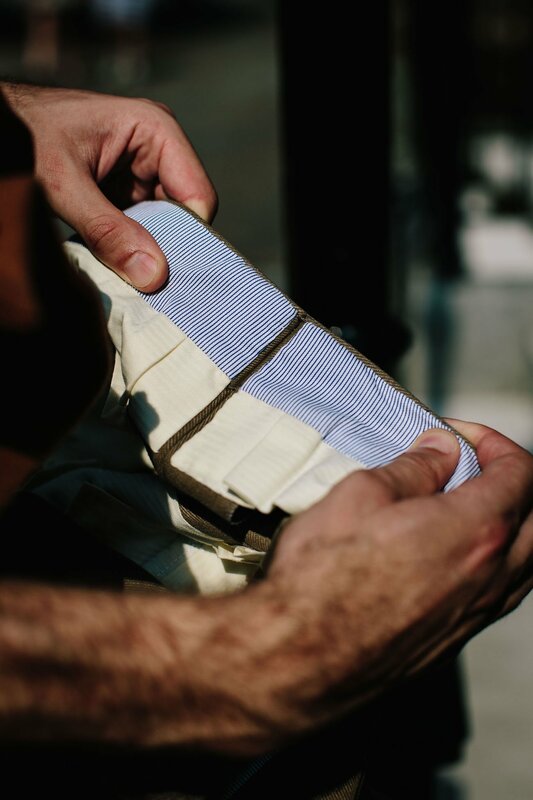 Once you’ve nailed your measurements with them there is no need to vary them based on fabric type; every fabric will behave differently with wear and so a good alts tailor is all you will need. Love the cut and the standard of finish looks to be superb. I’m particularly liking the higher waist band with the two button front and side fasteners – shades of Jason King and very 1972! That said, personally I’m not a fan of cotton unless it’s for chinos. Can you say, why you did not choose to have any pleats in the trousers? And about the pros and cons of cotton trousers with(out) pleats in general? Quite a nice post. I especially like the broad waistband. I’ve been toying with the idea to commission a pair of trousers from Marco and Massimo. I was wondering how the choice of the cloth usually works. Is it the client, who has to bring it or they offer a particular selection? At this point Simon, could you please recommend some nice makers? Say, if I was interested in something less formal, but still sharp piece, maybe cotton, or flannel. Pardon, if my question is fairly basic, but admittedly, I’m a newbie, and this would be my first such bespoke experience. Thanks. Excellent. Thanks Simon for this. Would a matching jacket/sports coat work? I ask because the styling of the pants elevate it above just simple casual pants, so pairing it with a tailored jacket would seem to be a natural progression. Wearing them together in order to achieve the look of a suit, and then the jacket/sports coat (as well as the pants) could also be worn separately with other (casual) pieces. However, it seems the cotton would be too heavy, no? I quite like the styling of the pants, which one doesn’t often see on casual pieces. Hope you don’t mind if I copy it with my local tailor. It won’t be as good in finish and make, but one has to make compromises, given one’s location, and more importantly, one’s budget. Simon, did these trousers have a button fly? Thanks Simon. I really like the antique trimmings but can’t find a supplier. Do you have any suggestions please? Hello! May I ask if there would be some manufacturers, stores (or websites), where one could buy decent rtw flannel trousers (or other formal to mid-formal trousers for the office)? thanks! I just received a lovely pair from Drake’s today, in fact. They are indeed very well made, but they may go back because the waistband is nearly to my navel and without a jacket on, that kind of rise is a bridge too far. I think a ‘mid-rise’ will be tough to find RTW. They are deliberately pretty high rise, yes. They have a proper high rise? How many inches is the rise Dan? Are you able to measure? I’m looking for a pair so might pop down to drakes if it’s a proper high rise. I made a pretty un-professional measurement (I was wearing them at the time) but it was around 12-13 inches (32cm-ish). Proper in my book, anyway. I realise now that any RTW rise measurements will be relative to height of the wearer. I wear a 32, but I’m also 5′ 8 1/2″, making the rise more pronounced on me than, say, the tall model in the photo. The light grey Rota pair at No Man Walks Alone are a more moderate mid-rise (26cm, or 27.5cm depending on provision of side tabs), which I’ll probably give a try. They’re not following Simon’s tab-on-seams preference, but I need to start somewhere! Intriguing, thanks for the info, I might try them out. My mTm trousers with the massive rise are for wearing with braces though and I know they would look ridiculous with any more casual clothes in 2017. The problem with trying new things is you need to kind of get used to them, but these are expensive experiments with high end menswear. I saw the ones at NMWA as well and they look too low rise with tailored wear for me, I reckon 12/13 is perfect for a all round non brace back trouser, I reckon give the ones you have a go if you can kind of see yourself wearing them. I am tempted to just have all my trousers made to measure to get exactly what I want now. Trousers are so hard to get right if you care about breaks, width of the leg and of course rise. Drakes charge 300 for their RTW, NMWA has a sale but still almost £ 300 with weak pound for Rota ones, Anderson and Shephard RTW are £365 with an up charge for changing anything. For another 100 quid or so I think it’s probably just better to get exactly what I want. Are the hems actually a little slanted? I notice the side tabs are not on the seam of the waistband. Is there a reason for that? way? What did men do before plastic and zippers were invented? I was under the impression that when buttons create marks in cloth this is called starring. I may have misunderstood. It may well be – I didn’t know that phrase. Thanks for the tidbit if it is. Thank you for sharing these trousers with us. I am currently debating between a 1.5inch one button waistband and a 2inch 2 button waistband (like the Cerrato trousers above). Do you have any style parameters or guidelines regarding waistband height? Are 2 inch waistbands more flattering for taller people with longer torsos and shorter legs? Do broader waistbands hide more belly if worn at a high rise or emphasize it? I have broad, square shoulders but an overall slim frame (small chest) with a bit of a belly. Just wondering how the standard 1.5inch extended one button waistband compares to the 2inch waistband. With custom and bespoke, you are often tempted to go for more unique options (as you’ve admitted!) and I think I fell victim to that as well. 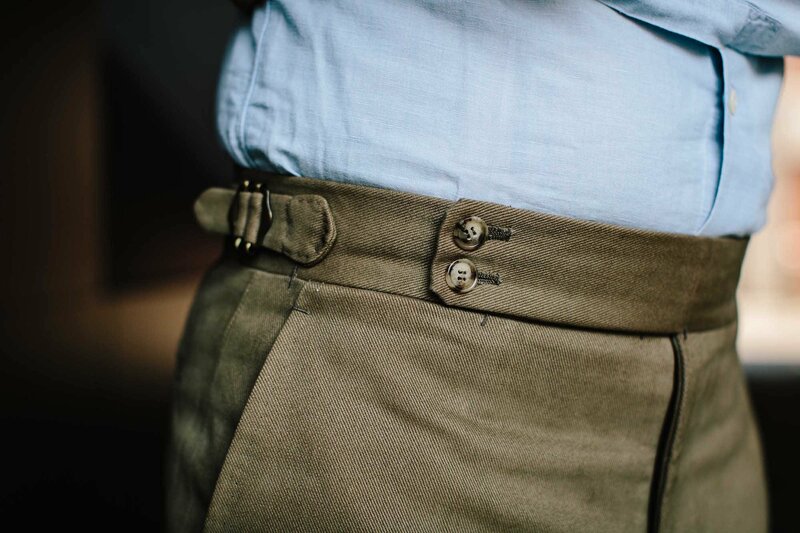 My goal is understated elegance so I will go with a one button waistband at 1.5inches – thank you for your guidance! I am trying to arrange an initial appointment with Cerrato in London and have emailed Marco / Massimo but as of yet no response. Do I just need to be patient or is there a better way to make contact? i was wondering if you have lined this trousers? And in general, do you have lining an all of your trousers? Which ones do you not line? I have read ones that you do not line you summer linen and cotton ones if i remember well. Do you wash these unlined ones in the washing machine then? And how about summer woolens, do you line them? And, would you line whipcords and cavalry twills (have you lined your fox cavalry twill?)? Since they are more on the heavy side and more sturdy fabrics and would not get easily buggy and shapeless. I would appreciate it very if you would share your experience on that. I line trousers by default, but the exceptions are summer trousers when heat is a priority, and casual ones like cottons. Regarding neapolitan trousers, is there any difference in silhouette or cut as compared to English, French, or northern Italian trousers? Or are the differences almost entirely about aesthetic details? …so i suppose that this trousers here fall under ‘casual cotton’ and are not lined, right? I bought in Vienna some time ago a very casual cotton fabric in a very summery weight. The fabric merchant told me to put the fabric at home in the washing machine before bringing it to the tailor. Like this and if i will not line it i will be able to wash the tailored trouser then regularly in the machine. He suggested doing this first wash at home and with the detergent i usually have in order to shrink adequately. What are your thoughts on that procedure? I have already washed the fabric but did not bring it to ma tailor yet. It is an Ermenegildo Zegna Selection Cotton Fabric. 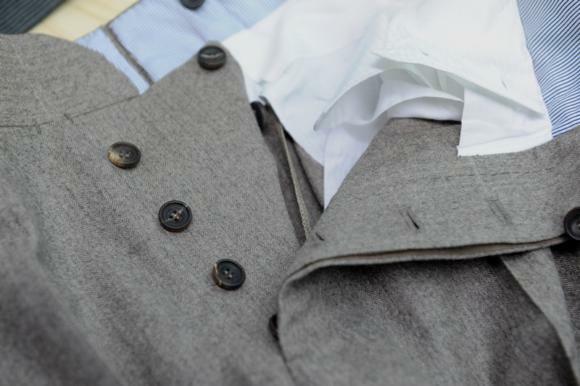 Generally, tailors will wash a cotton fabric themselves before using it, so I would rely on your tailor for that – though perhaps mention it to him. I wouldn’t use a washing machine on the trousers, even without a lining. There’s still lining around the waistband and you’re going to find it hard to press the trouser, particularly around the waistband, well after washing. Simon, I’m thinking of commission a similar pair of trousers but wondered how useful you’ve found this colour and style (can be dressed up or down) in your wardrobe? I’d imagine very useful given flexibility but grateful for any thoughts. Anything you would change?